New Ross seems to draw me. Every trip I’ve made to Ireland has included time in New Ross and three times I’ve stayed for many weeks or months in the countryside nearby. It’s become “my town” in Ireland. 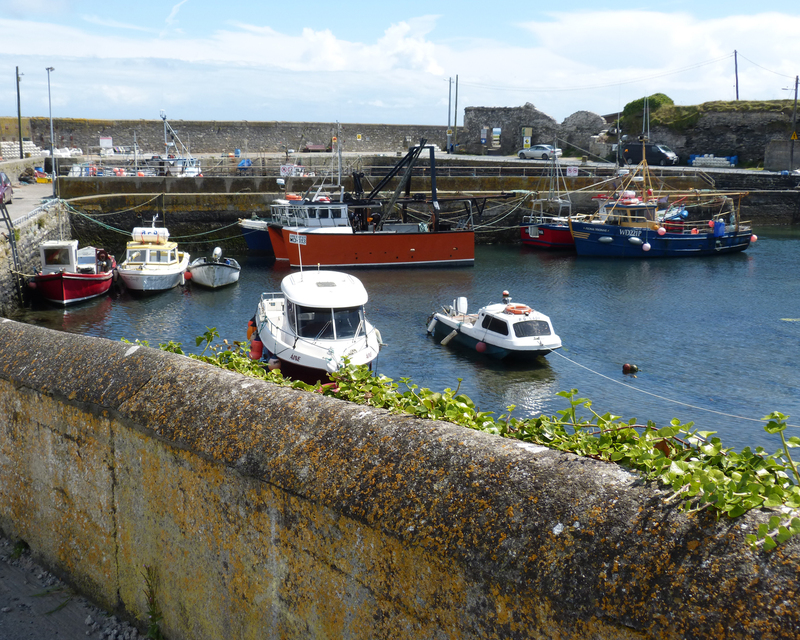 I find the people here to be very friendly and the town is a good base for exploring southeastern Ireland. William Marshall was an important Norman-English knight who won the friendship and admiration of King John of England. He was given a wealthy bride, Isabella de Clare, the daughter of “Strongbow” (Richard de Clare, second Earl of Pembroke). Together they brought the southeastern corner of Ireland out of the middle ages. Isabella is credited with beginning the town of New Ross in the year 1189. William Marshall made New Ross his port city because of its location on the river Barrow. This “power couple” began the city of Kilkenny and built the Irish Tintern Abbey a few miles from New Ross. Today this 800-year-old town is becoming a popular stop on tour itineraries. That’s largely because of the connection to New Ross of President John F. Kennedy. 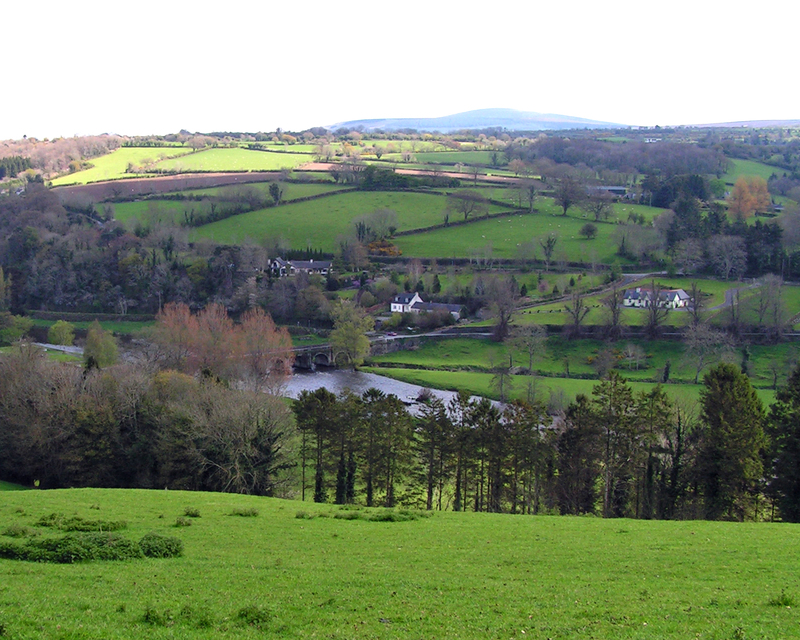 The president’s ancestors lived on a farm six kilometers outside New Ross. His great-grandparents departed Ireland on a ship from here. 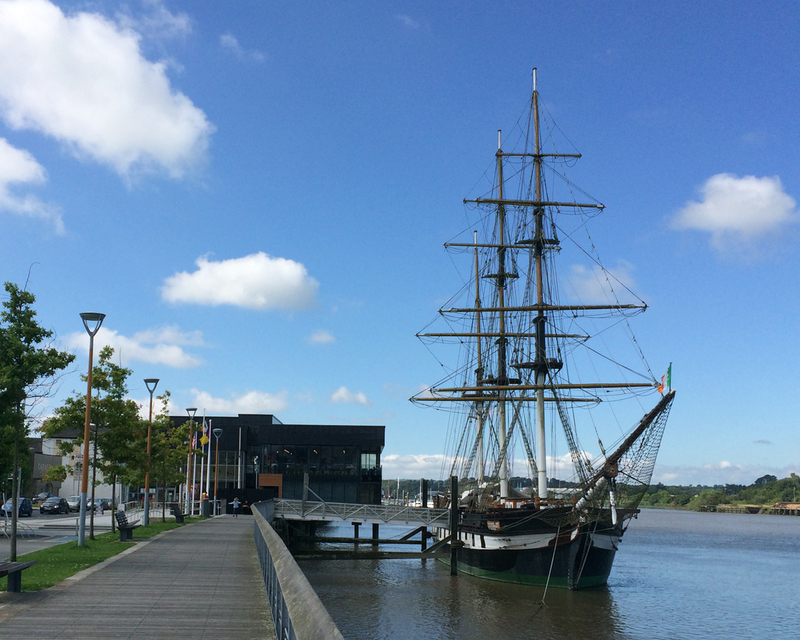 Today a replica of that ship, the Dunbrody, provides an opportunity to discover the miserable conditions immigrants to the New World were made to endure. One of the last public appearances President Kennedy made was in New Ross. That event has never been forgotten and it’s memorialized on the main street of the town today. 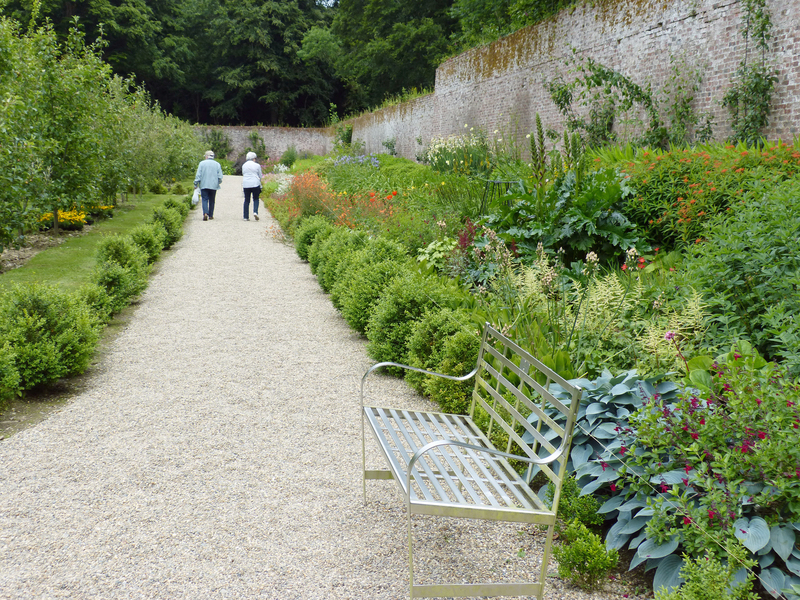 Irish-American donors and the Irish government cooperated to create the John F. Kennedy Memorial Garden and Arboretum near the old Kennedy family farm. The town is hilly. The old town center lies along the river banks and a new, modern town is developing on the other side of the hill. Little has changed in the old town. Three tall steeples grace the skyline. The thosel – Irish for town hall – is at the center of a small nest of shopping streets. It appears to date from the late 18th or early 19th centuries. Many of the shops and pubs are old, and bear the names of their owners. Not much has changed in the last 50 or 100 years, and I like that. I’m already making plans to return next year. The photo above is of the ship Dunbrody. The building behind it is the very good tourist information center. It houses a small museum about Irish emigration and a good restaurant. In 2016 I was in Ireland for seven weeks in April and May. When I returned home to North Carolina I experienced one of the hottest summers ever. Each day I’d look at the weather app on my phone and read that the temperature I was feeling was about 97 degrees. I’d also see that the temperature in New Ross was 67. Before the summer was out I made arrangements to rent the smallest cottage at Fruit Hill for all of the summer of 2017. I didn’t regret that decision! Once or twice this summer the high temp was 25 degrees Celsius (according to the thermometer in the car) which is about 80 degrees Fahrenheit. Most days the afternoon temperature was in the high 60s. I never once wore any of my short-sleeve T-shirts; every day this summer I wore a light sweater all day. Although the skies were often cloudy there were not a lot of rainy days. In 2005 my late husband and I were considering moving to Ireland. Because his grandmother was born there he was entitled to Irish citizenship. We wanted to test life there, including the weather, before making any final decisions. 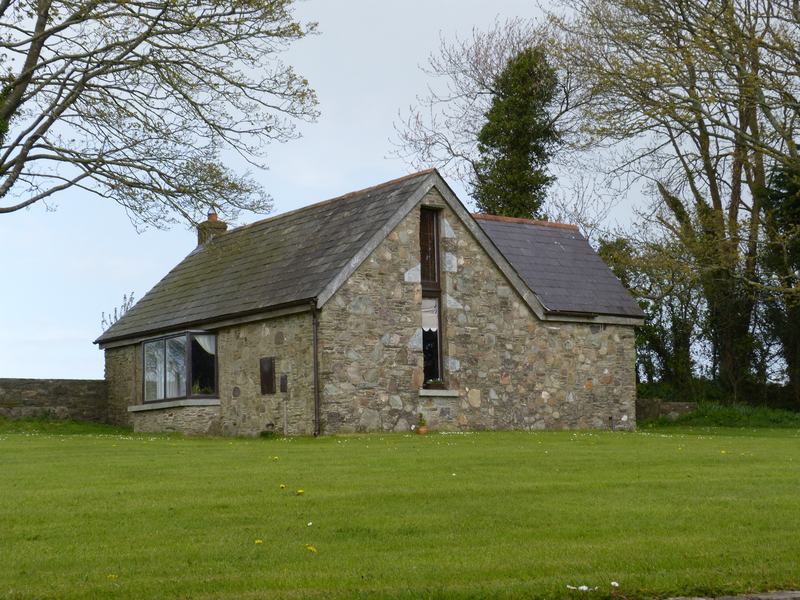 We rented a cottage in the same area of Southeast Ireland for four months in winter, from early January until the end of April. Every morning George recorded the temperature. It was never lower than 40 degrees. It snowed once. Ireland is positioned very far north on the globe. During June and July the sun doesn’t set until nearly 10:00 pm. In winter, the hours of daylight are short. The island is protected from temperature extremes by the jet stream but global warming is a great concern to many Irish people. Should the jet stream change its course, Ireland would experience very different weather conditions. 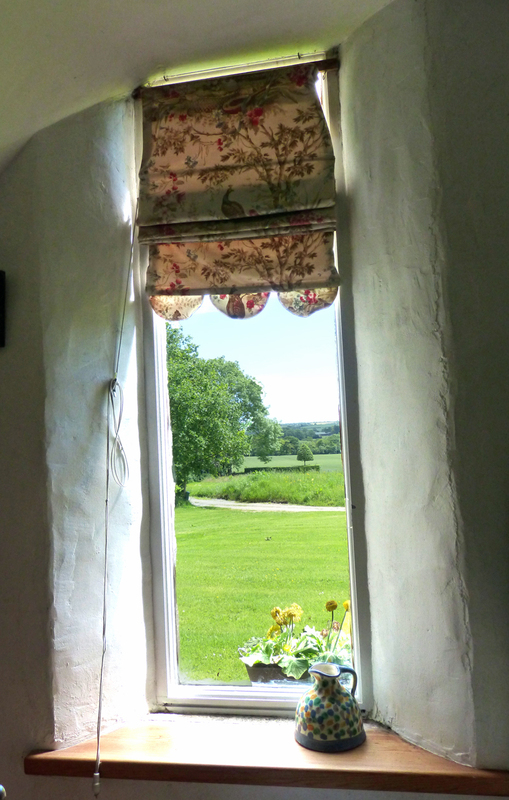 The photo at the top of this post is the view from the kitchen window of my 2017 Irish cottage at Fruit Hill. 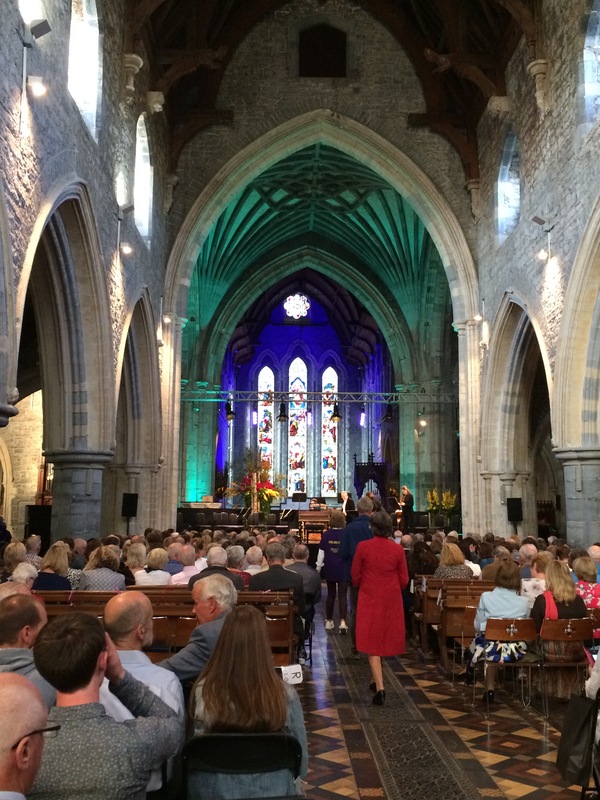 Recently, in the 13th century cathedral in Kilkenny, I heard a small choir sing the original version of Handel’s “Messiah.” It was just one of the many offerings of the Kilkenny Arts Festival presented over a ten-day span in August. A few years ago I attended an opera performance in the old theatre in the town. In Kilkenny I’ve enjoyed Irish music in lively pubs and toured a castle, part of which dates back to the year 1195 when the city began. I’ve shopped and dined well. The city is small but it’s successfully filled with many enticing businesses. Kilkenny is my favorite Irish city. It is called Ireland’s “medieval city.” An ancient city, it provides a perfect blend of history, interesting shops, traditional pubs and good restaurants. There are a number of centuries-old buildings to explore. The recent addition of the “Medieval Mile Museum” installed in a very old church in the very center of the town promises to make experiencing the town’s long history easier for visitors. Like many Irish towns, the shops that line the streets of Kilkenny are painted in bright colors. Some of the shops retain identifying signs dating to the 19th century. My favorite shop is called “Yesterdays.” Located on Lower Patrick Street, just a few steps from the center of town, the shop, packed full of artful objects for the home and for gifts. There’s always something new and delightful on offer. A lovely small hotel called Butler House is just across the street. Many old houses now occupied by businesses feature Georgian-era doors brightly painted such as the bright yellow doors of Butler House. 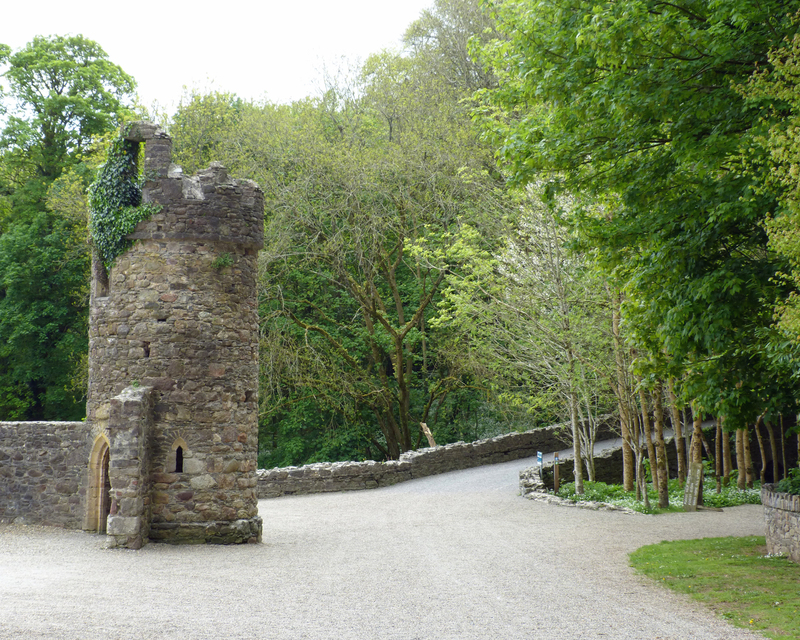 The location of Kilkenny in the middle of southern Ireland and an easy drive from Dublin and the south on modern highways makes it an ideal location from which to discover much of Ireland. 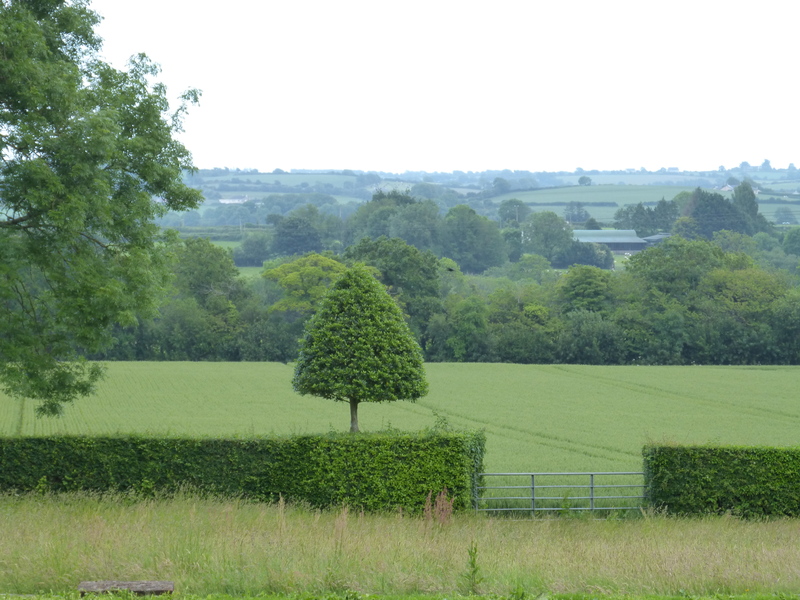 There are many hotels in the town and self-catering cottages scattered about the surrounding countryside. The photo above was taken just prior to the performance of Handel’s Messiah in the 13th century cathedral in Kilkenny. Kilkenny City Online is a fun site, useful for planning a visit there. Wikipedia has a detailed description and history of Kilkenny. Ireland’s 21st century restaurant and hotel offerings begin with traditional, home-grown foods: delicious soda bread (called “wheaten bread” in some places) and smoked salmon and the famous “Irish breakfast” of sausages, bacon, beans, broiled tomatoes and eggs. In old pubs all over the country visitors enjoy delicious seafood chowder and other longtime favorites. In restaurants around the country, however, innovative chefs are combining fresh local ingredients, traditional recipes and new ideas to create an exciting new Irish cuisine. One of my favorite places is a small restaurant and inn called Zuni in Kilkenny. Its upscale dining room overlooks the open kitchen where chefs turn out original dishes that are always excellent. And there’s Avoca, a successful Irish company that combines clever retail shops, food markets and really good restaurants in a number of locations around Ireland. The chefs create ever-changing seasonal menus offering the freshest local dishes. Recently I had a spectacular crab salad at Avoca. Local food isn’t confined to restaurants. Grocery markets offer many of my favorites. I love “West Country” yogurt made in west Cork with fresh cream and Irish milk. The tiny fish market in New Ross offers a wide choice of fresh fish including salmon, crab and haddock. In the southeast, Wexford strawberries are sold from small booths along the highways throughout the summer. A new facility covered by greenhouses is located near the place where I stayed this summer. I suspect tomatoes, strawberries and other fragile fruits are being grown there. Chicken is especially good in Ireland where a photo of the farmer who produced it along with his name and county are shown on package labels. 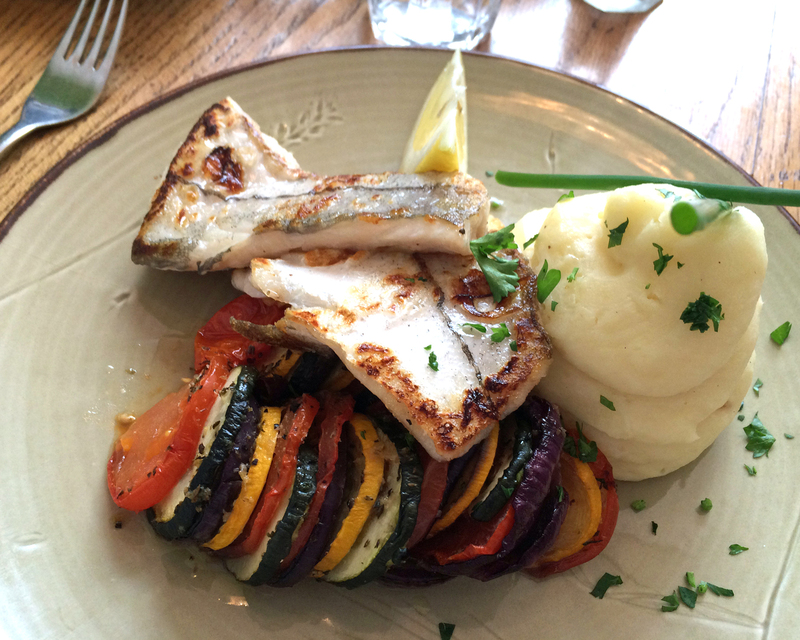 Pride is a chief ingredient in delicious Irish cooking and it can be tasted in every bite! I had the good fortune to spend all summer this year in Ireland. Irish immigration laws allow Americans to stay there for only 90 days. Now that I’m home again, I’m feeling a bit sad about leaving beautiful Ireland. 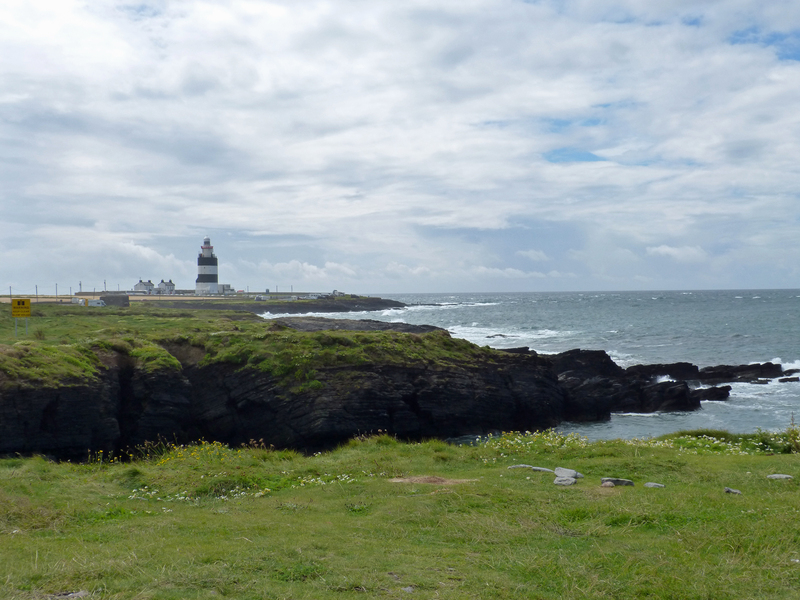 Beginning with this post, I’ll be sharing the characteristics of Ireland that have caused me to fall in love with that small green country. Ireland is littered with small towns, smaller villages and many wide-spots-in-the-road with very strange names. These places are hundreds of years old and many of them retain some very old buildings and the atmosphere of the 18th and 19th centuries. Narrow farm roads crisscross the green hills. Often traffic on them is slowed by big blue tractors driving no more than 40 kilometers per hour (about 25 mph). Farming appears to be the main occupation supporting many families – perhaps a majority. Farms spread over the green hills, divided by ancient hedges and stone walls that are relics of centuries past when Ireland was a colony of Great Britain. The people who live in these towns and villages and farms are gentle souls, always polite and friendly, speaking with the gentle brogue for which Ireland is well-known. In the west of Ireland many people still prefer to speak the gaelic “Irish” language. Signs are bi-lingual everywhere. Dublin and other Irish cities are fully engaged in the 21st century but in the countryside life seems to be as gentle as a misty Irish morning. And I loved that! 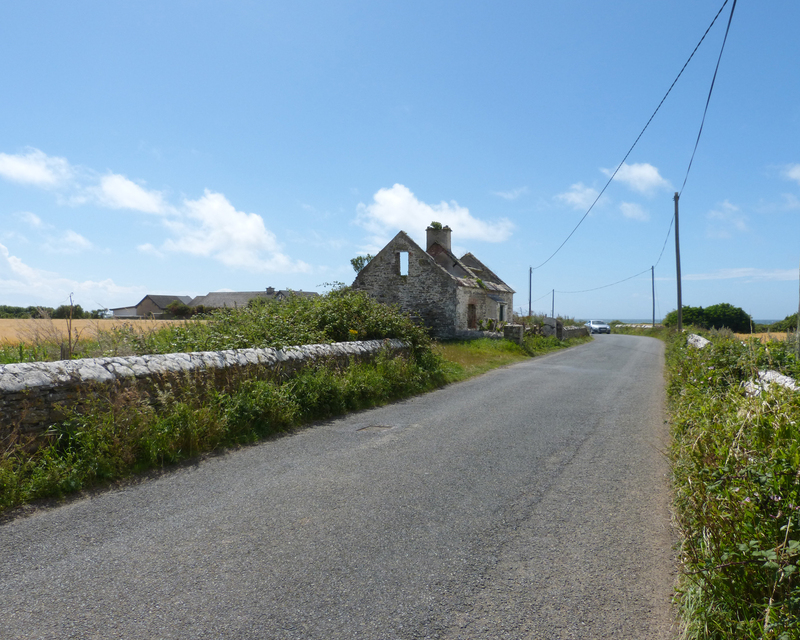 Near the place where I am staying this summer in County Wexford, Ireland, is a small peninsula called “Hook Head.” Abandoned old homes and churches are found often along the narrow roads that lead to the end of the peninsula and Hook lighthouse. 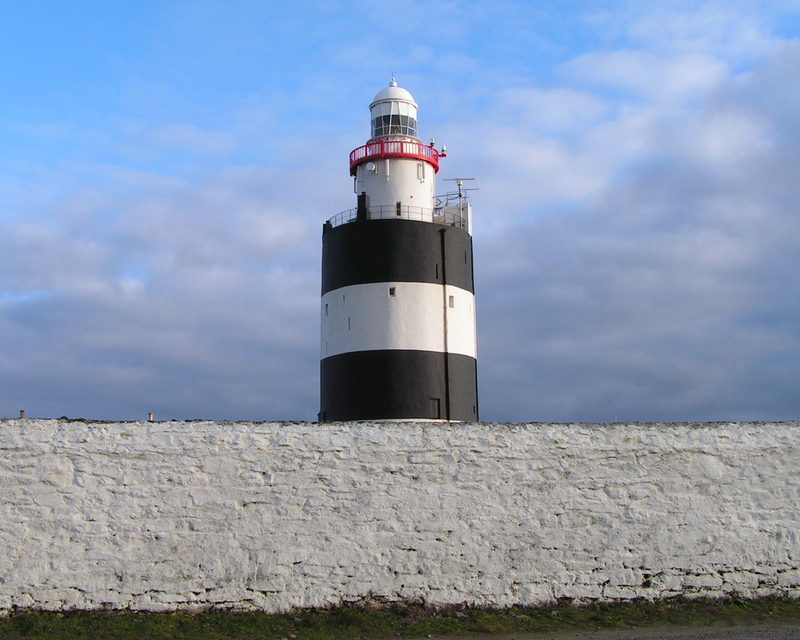 The lighthouse is the second oldest functioning light in the world. It was built around the year 1200 on the orders of William Marshall, a member of the English royal family whose name is connected often with the history of this region. Here are a few of the many photos I’ve taken on the Hood peninsula. 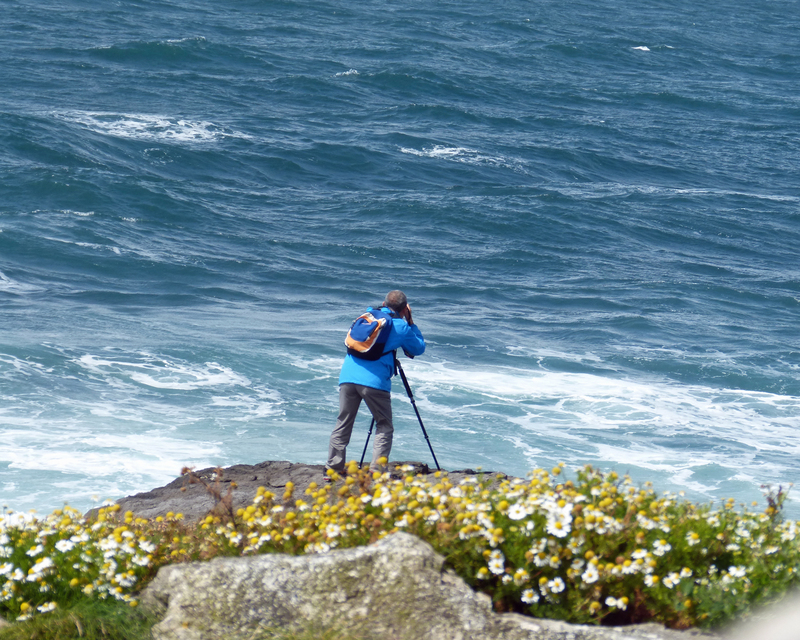 I hope they will tempt you to visit southeast Ireland. The coastline of the peninsula is rugged, cut deeply. It’s a popular area for biking, hiking, and kayaking. Just a mile or so before the end of the peninsula and the lighthouse is a tiny village comprised of the remnants of very old houses and some lovely new homes. The road is narrow and lined with flowers, some naturally occurring wild flowers and some planted by people whose homes are along this road. This house is slowing being taken back by nature. It’s next to the house shown above and directly across the road from the church ruin in the next picture. 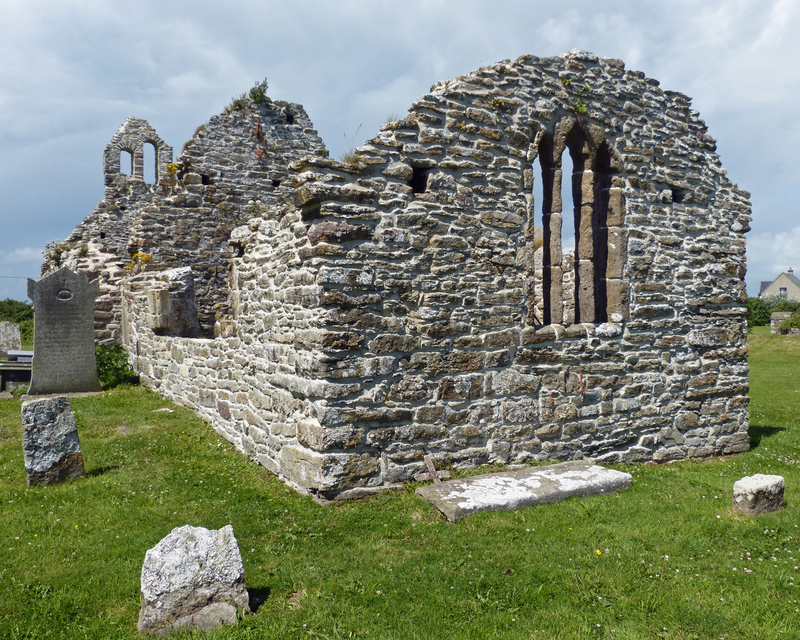 This church is likely the ruin of a very old monastery, known to have been created here ca. 500 AD. The Knights Templar were in this area in that era and are believed to have installed a monastery here. The site noted below provides a simplified history of this region that explains this in more detail. A mile or two from the lighthouse is a tiny village called Slane which is the site of this medieval castle. It is not the only castle on the peninsula but it is the most complete. 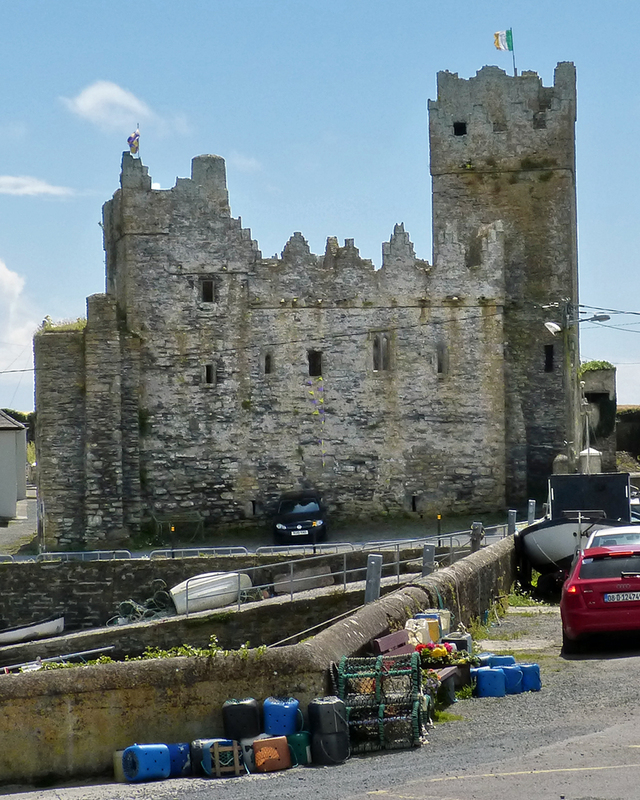 Just in front of the castle in Slane is this small protected harbor. 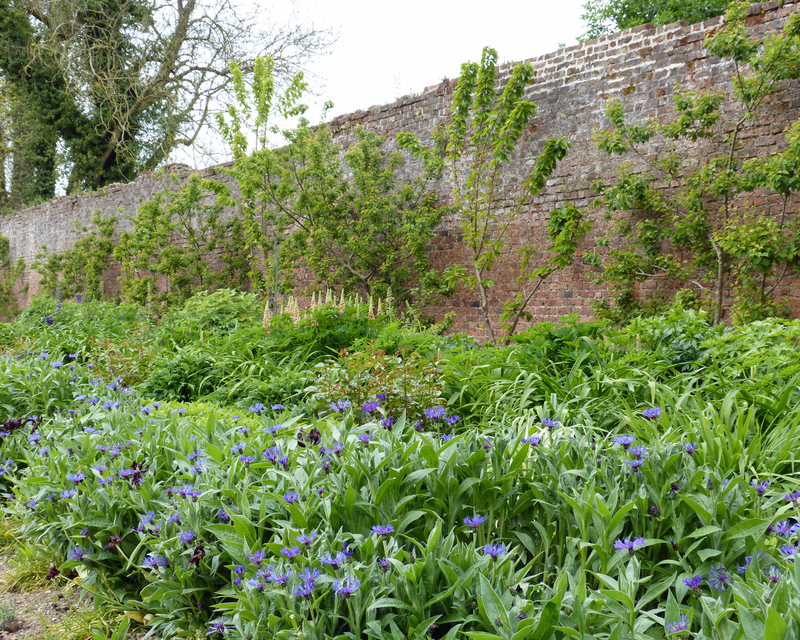 In the early 1800s the Colcoough family (pronounced Coke-Lee), residents of Tintern Abbey for centuries, created a large walled garden about a kilometer away from their home. Little remained but the brick walls and 30 giant Sitka spruce trees which had been growing for a couple of hundred years. 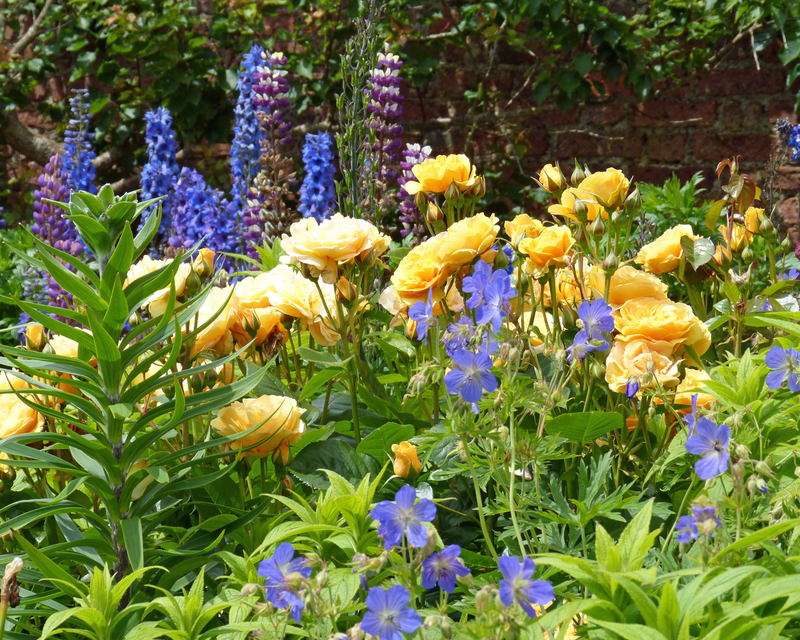 In 2010 the Hook Tourism Council began recovering the garden. 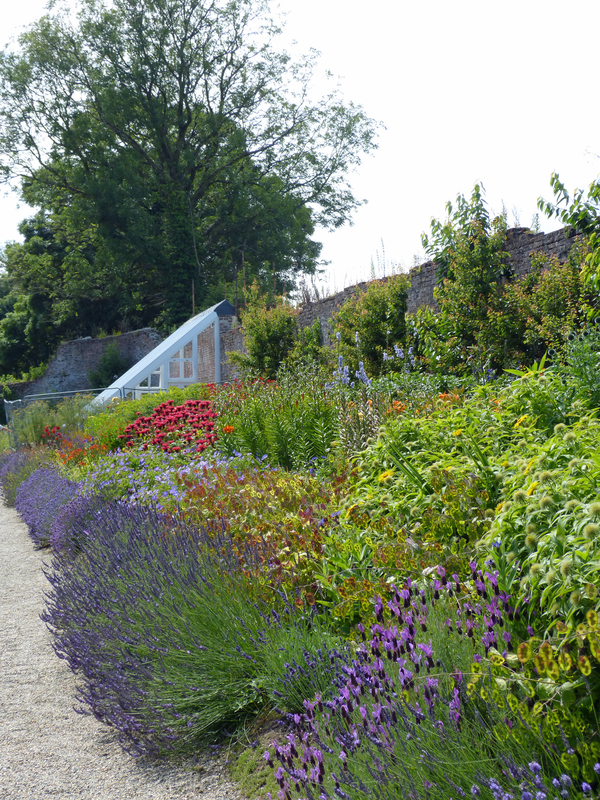 Today a magnificent garden delights visitors throughout the year. Led by professional horticulturalist Alan Ryan, a team comprised of staff and volunteers has made this 200-year-old garden spectacular. 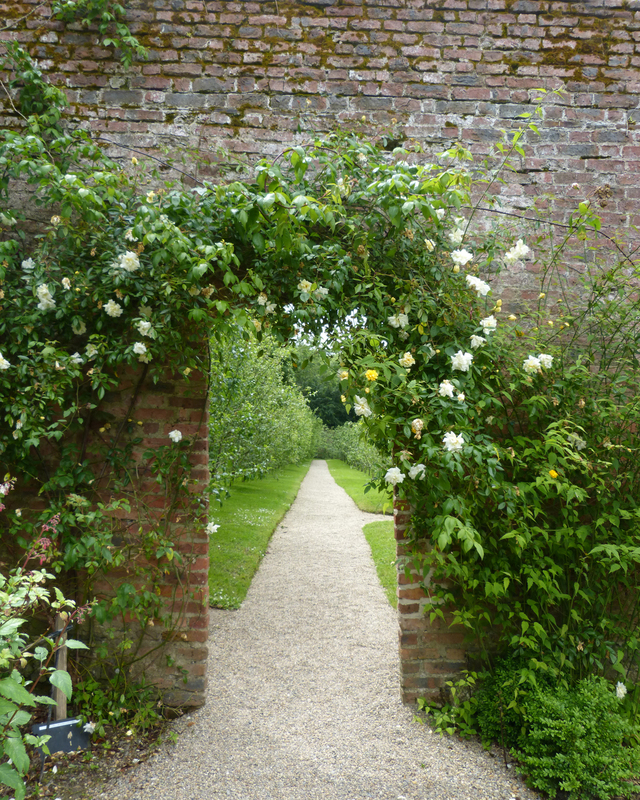 Divided by a brick wall, the front half of the garden has deep perennial borders on three sides. 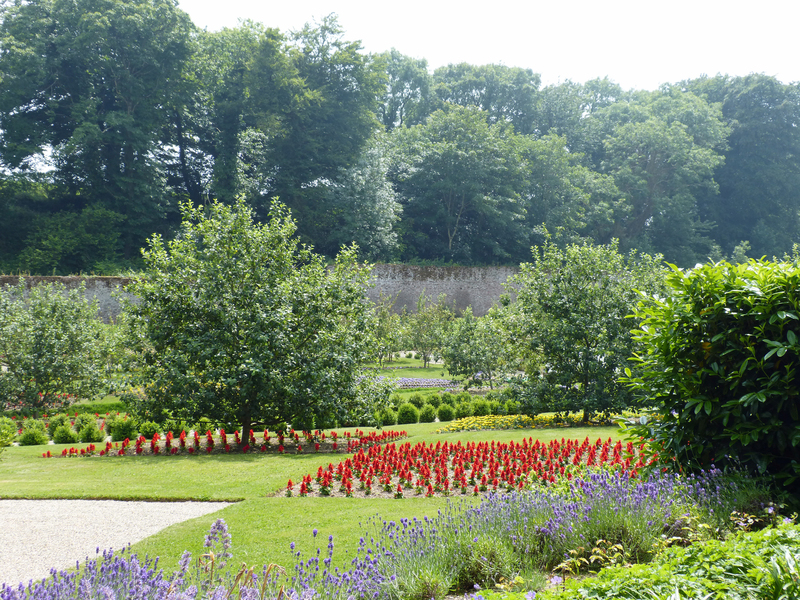 Recently historical surveys uncovered footprints of diamond-shaped flower beds in the center of the space which have been restored and filled with red, yellow and blue annuals. In 2016 I discovered this garden during a visit to the abbey in May. 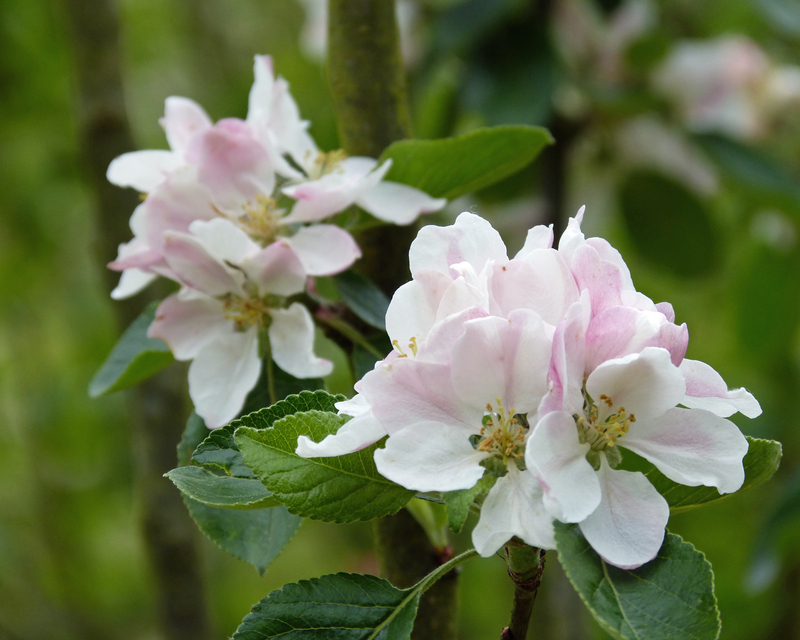 Although the weather was cool, many plants were large and blooming. 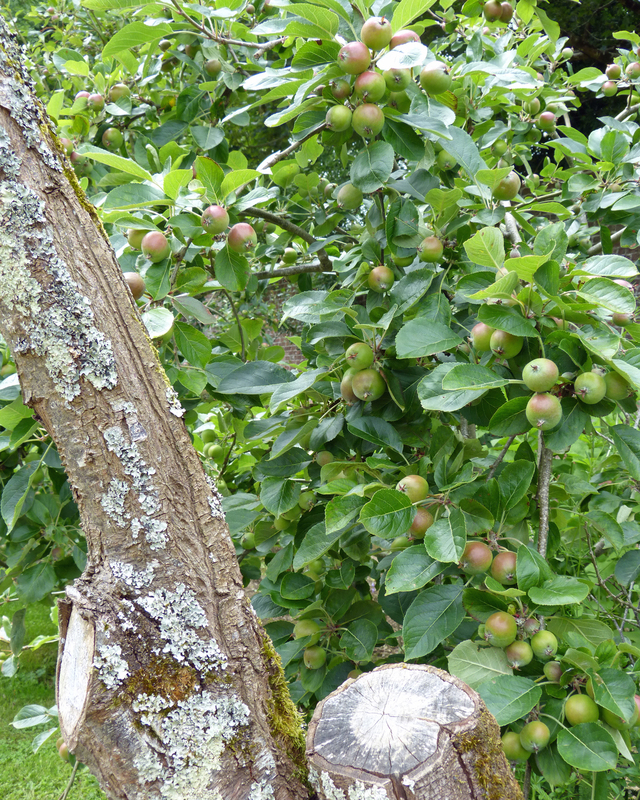 Apple trees and other fruit trees grow on or near the walls all around the garden. They were in bloom in May. When I returned to the garden in early June this year I was really surprised by how advanced the plants were so early in Ireland’s cool summer. I asked what type of fertilizer was used. Mr. Ryan explained that the garden is entirely organic, that the soil is very rich as a result of being abandoned for so long, and that now all dead plant material is left in the garden as mulch. He also pointed out that the brick garden walls soak up the heat of the sun and raise the temperature in the garden by several degrees. 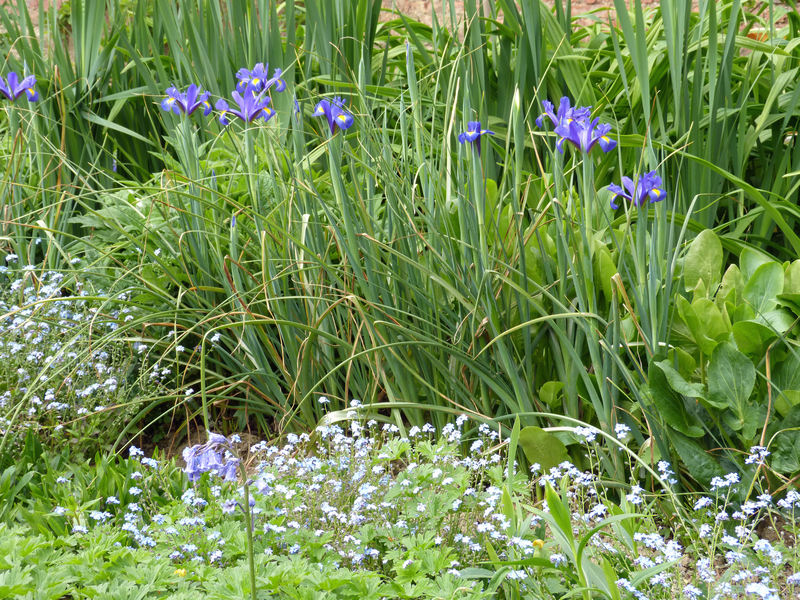 By mid-July the garden was in full bloom, bursting with color. 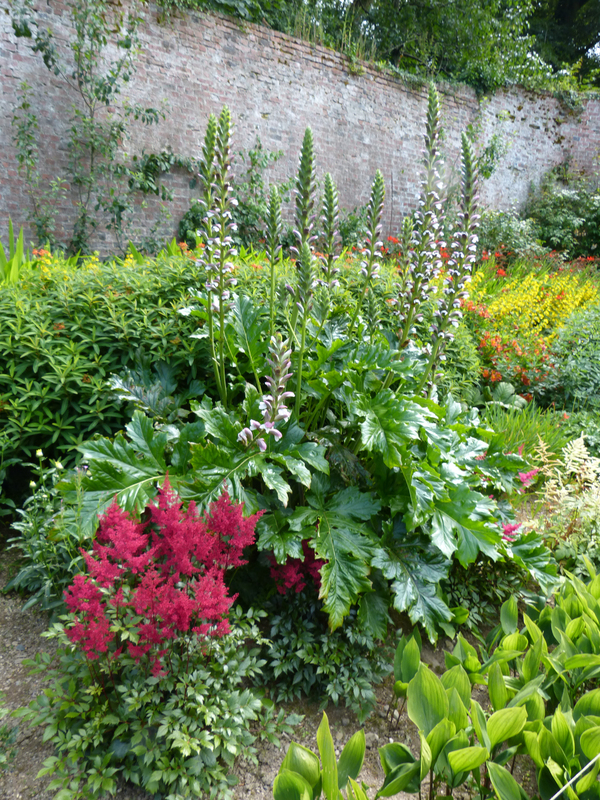 This spectacular acanthus plant was a new discovery for me. The garden is divided by a brick wall. 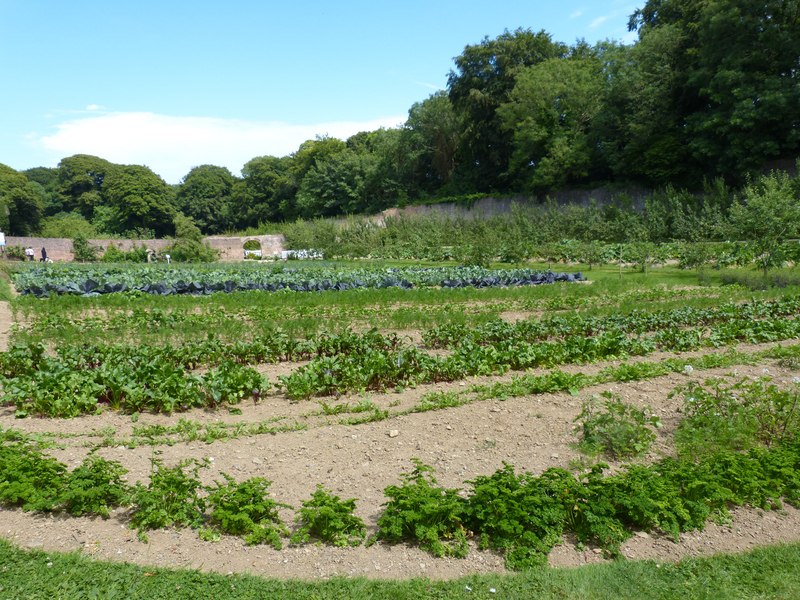 The back half is a kitchen garden, as it was in the 19th century. 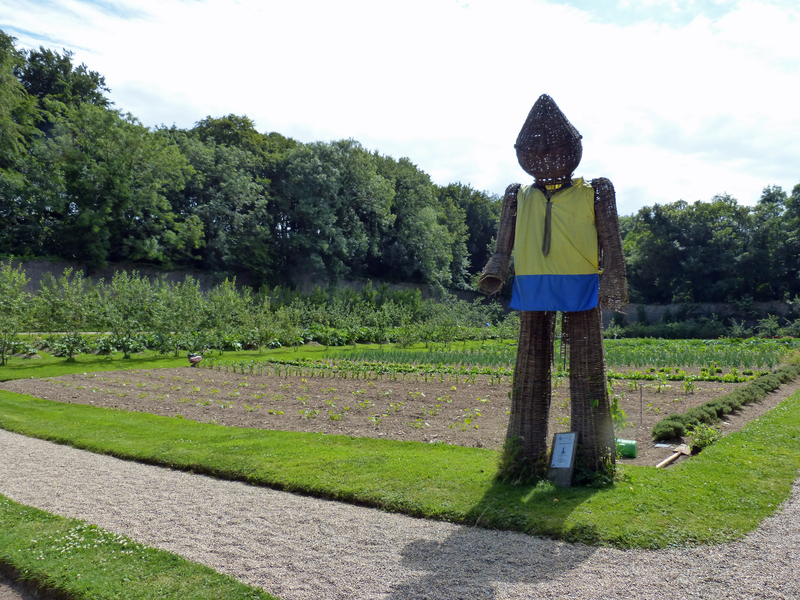 A tall man made of wicker stands guard at the entrance. An enormous variety of edibles is grown here, ranging from apples to artichokes. Everything flourishes in this garden. Irish weather, famous for being damp and cool, irrigates the garden naturally. Everything, including herbs, grows well here. 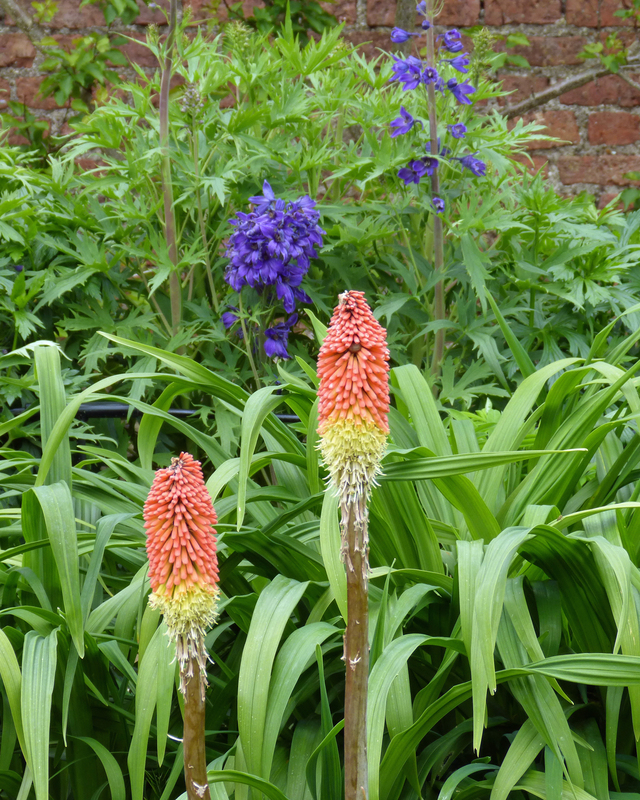 I try to return every week or two, watching the changes in Colclough Garden. It’s been a delightful learning experience. Acres of woods surround Tintern Abbey. In 2016 my friend Bee and I discovered a walking trail that is one section of a long-distance walk in County Wexford, Ireland. The walk begins at this old stone bridge protected by a tower. We were there in May, when it seemed everything was in bloom and when the brook was rushing by. 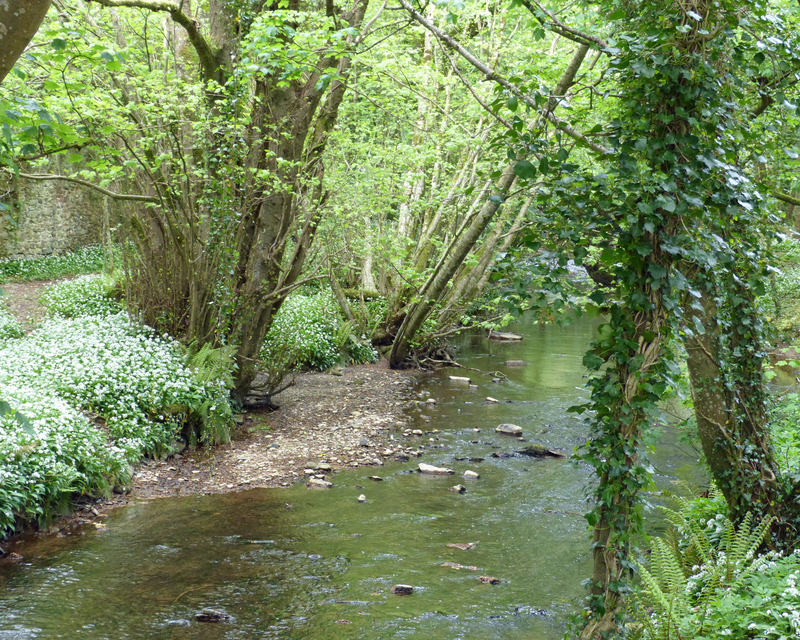 A mild aroma of garlic filled the air because the land was covered in blooming wild garlic. We were even welcomed by a fairy! Our “fairy.” A young girl in white came running toward us just as we arrived. 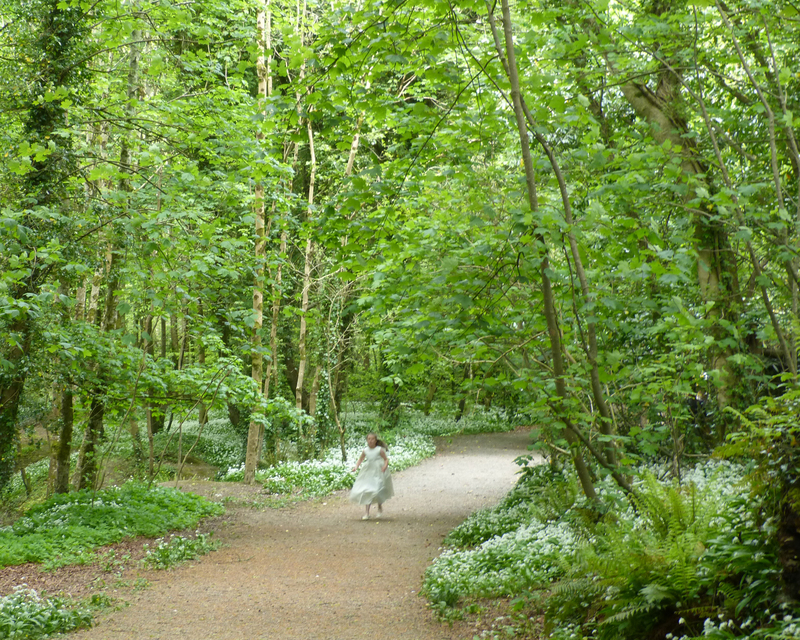 She was celebrating her first communion with her family by having a picnic in the woods. 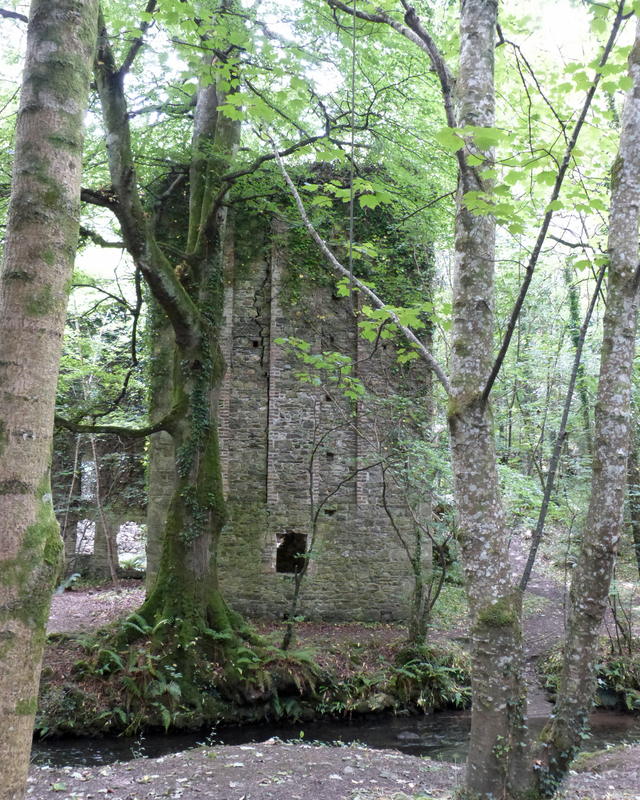 We found an ancient “castle” as these common old stone tower-houses are called. This one has been extended by several rooms on the ground but it’s all a ruin now. 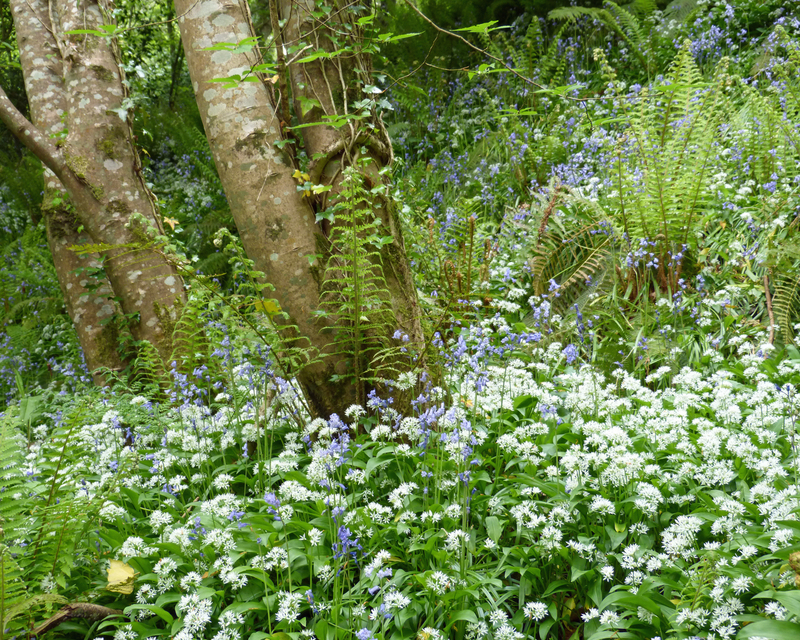 A fine path lined by blue and white flowers runs alongside a rushing stream. 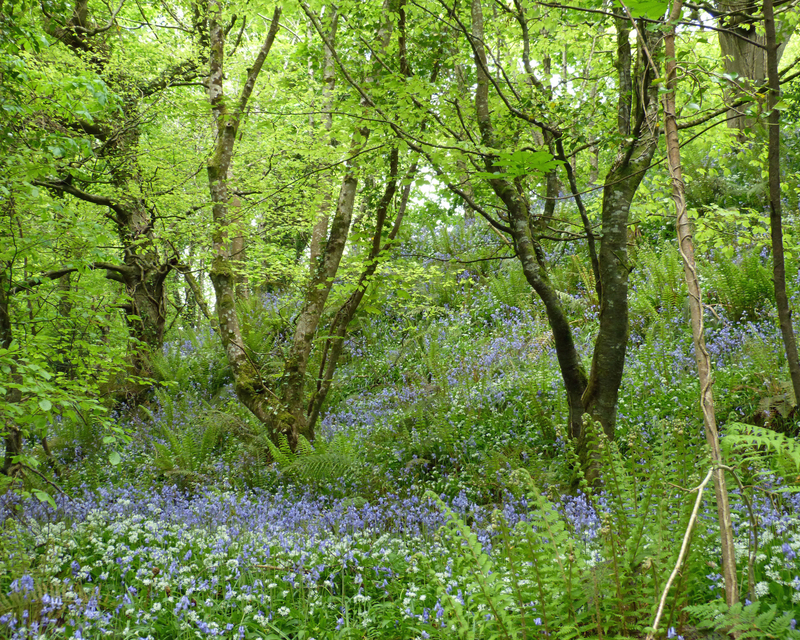 Blue English bluebells bloom abundantly all over Ireland in late spring, and in this woods they are surrounded by the white flowers of wild garlic. The woods are dense with the freshness of spring. 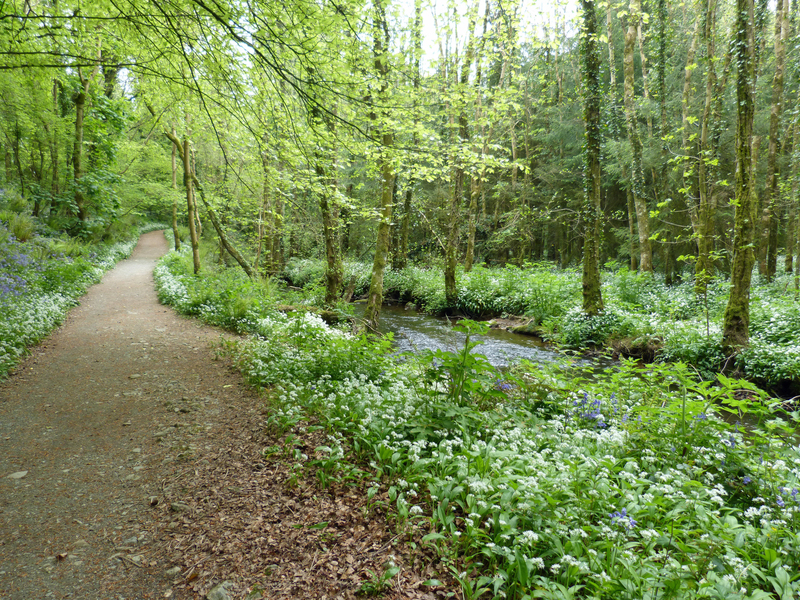 A walk here feeds all the senses: the newness of spring is a treat for the eyes, the aroma of the woods in spring for the nose, the sound of the stream rushing by, the touch of fresh green leaves and flowers, and the taste of a bit of wild garlic taken home for a salad. This year I returned in early June to the place I love in County Wexford and to Tintern Abbey. I walked in the woods again and I discovered something entirely new to share with you. That’s coming up in Part 3. I hope you’ll come back in a few days to see it. 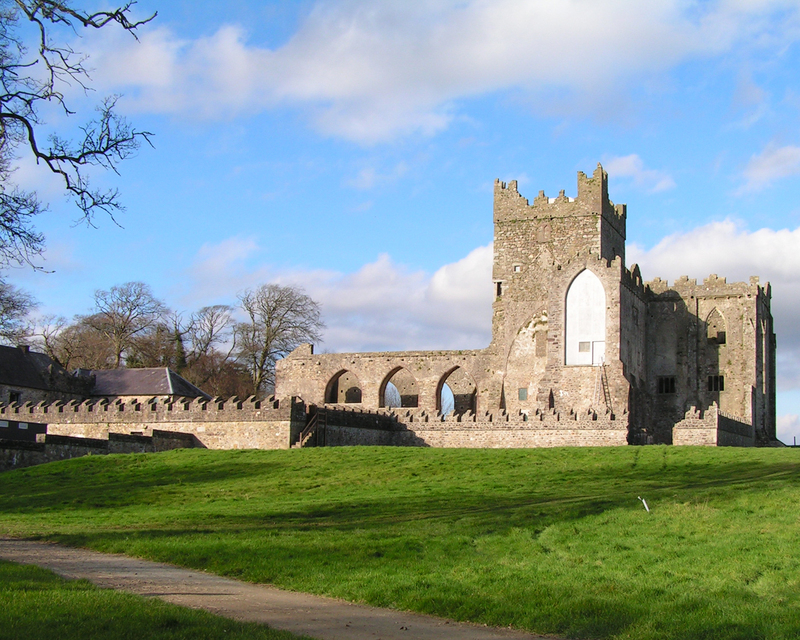 Ireland has a great many abbey ruins that date from the 12th and 13th centuries. At one time the monks living there were very wealthy, very pious, very close to Rome. When Henry the 8th dissolved the abbeys and persecuted the monks, the great estates and the monastery buildings were given to important Englishmen who had been loyal to the king. Tintern Abbey in County Wexford, Ireland, was one of the richest and largest of the abbeys. Today much of the original building survives. You may have heard of Tintern Abbey because of the famous poem by William Wordsworth, and if so you may be confused because you think it’s in Wales. There are, in fact, two Tintern Abbeys. The Welsh abbey is older and larger and much better known. A view of Tintern Abbey as it stands today, after much restoration work by County Wexford. The large window space filled by wood painted gray would be much nicer filled with glass. There’s a very good history of this place on a site called Megalithic Ireland dot com. Because I think the creator of that site likes to share Ireland’s history liberally, I’m going to quote liberally from that site which tells the story of Ireland’s Tintern Abbey much better than I can. 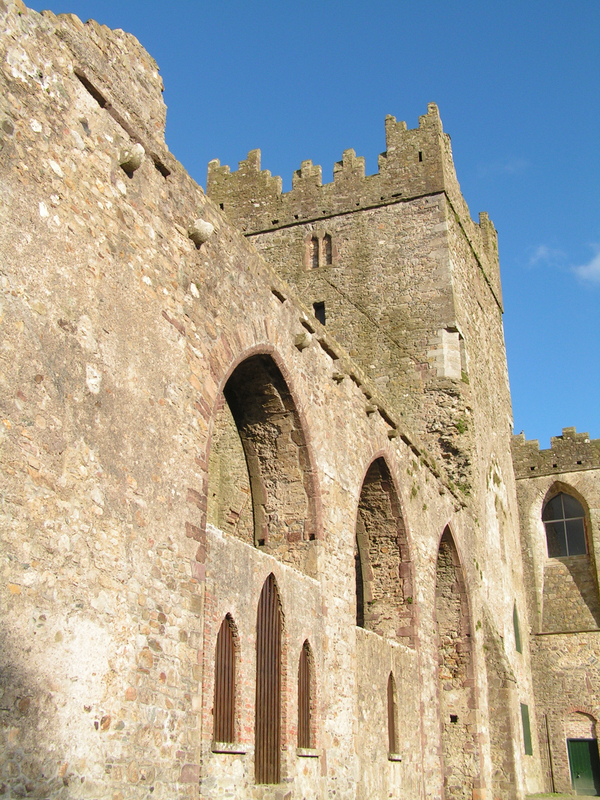 “The first Cistercian abbey in Ireland was established at Mellifont in 1142, but it was not until the early part of the 13th century that the abbey at Tintern was founded. The Anglo-Norman Knight William Marshall, first Earl of Pembroke, was the patron of Tintern Abbey in Monmouthshire, Wales. On his return to Ireland, with a new title, Lord of Leinster, his ship ran into a storm. Marshall vowed to establish a monastery wherever he landed safely. 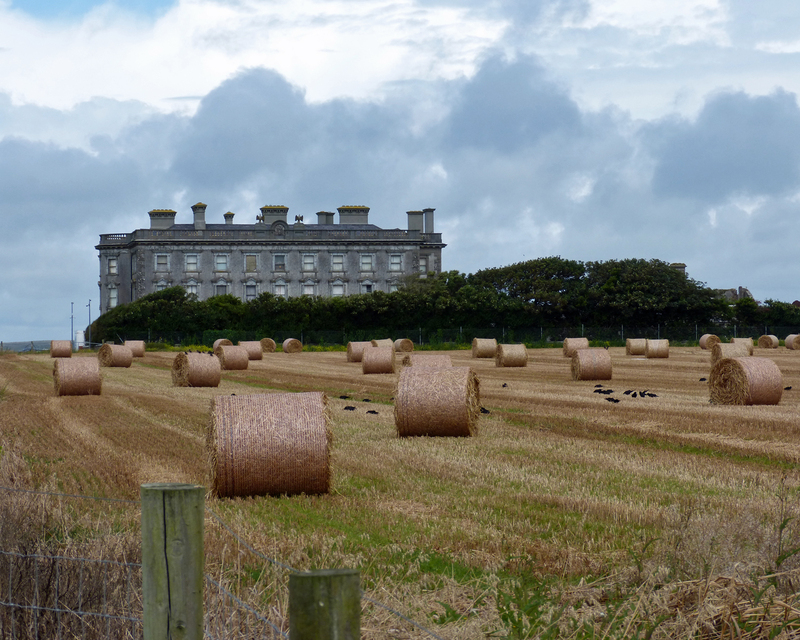 After landing at Bannow Bay in Wexford he bequeathed 3,500 hectares of land for the foundation of a Cistercian abbey. The abbey was named after the one in Wales and also colonised by monks from there. To distinguish them from each other, the abbey in Wales was known as Tintern Major and the Irish one, Tintern de Voto-‘Tintern of the vow’. “The abbey was built to the usual plan for Cistercian monasteries. The church was originally cruciform in shape with small chapels in the transepts for private prayer. What we see today are the central aisle of the nave, the crossing tower, the chancel and the Lady Chapel, which was part of the south transept. The rib-vaulted chapel was originally divided into three separate chapels by screen walls. All these structures date to the 13th century when most of the original buildings were replaced. Like most monasteries very little remains of the cloister or the domestic buildings. There is a corbel table on the the north and south walls of the chancel. This table features 18 grotesque head carvings, some of the heads that appear on the south side of the table are pictured below. At the abbey there’s a display of drawings that illustrate how the abbey changed over the centuries. 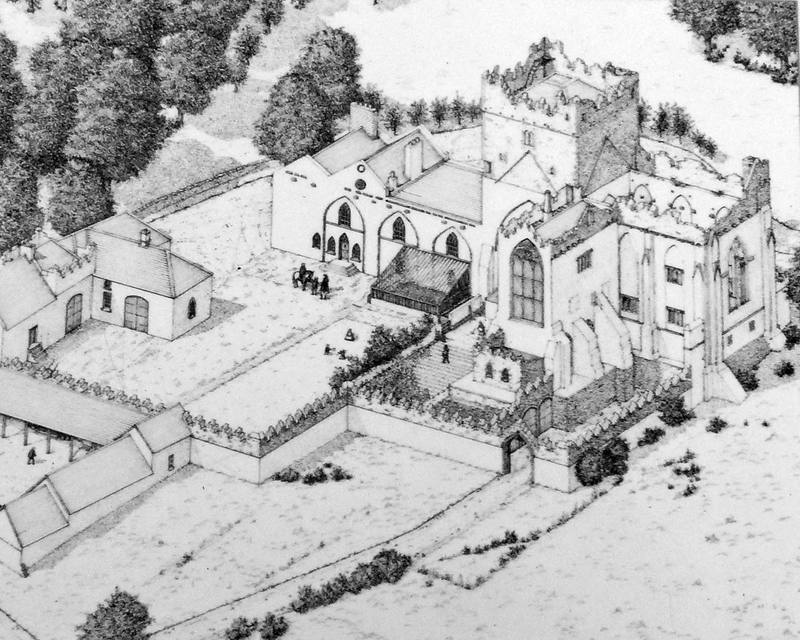 This one shows what a grand home the Colclough family made of the abbey. Tintern Abbey became a very grand home. Members of the Colclough (prounced Coke-lee) family lived here until 1959. There are excellent photos of the abbey on the website being quoted here. The photos on this blog are mine. There are two other good reasons to visit Tintern Abbey in Ireland. I’ll tell you about them in my next two posts. My delightful summer in Ireland has begun! I arrived on Sunday morning, managed to collect a rental car and drive it safely for 2+ hours to the farm near the town of New Ross, Ireland that I consider my second home. On the way I spent more than a week in my old home town of Scituate Massachusetts. (I’ll tell you about that in my next post.) Most of my week in Scituate was spent in unseasonably cold, wet weather and I seem to have brought it with me. This morning the sun is shining but I’ve been very chilled during my first two days in Ireland. I have rented a small cottage for the summer. 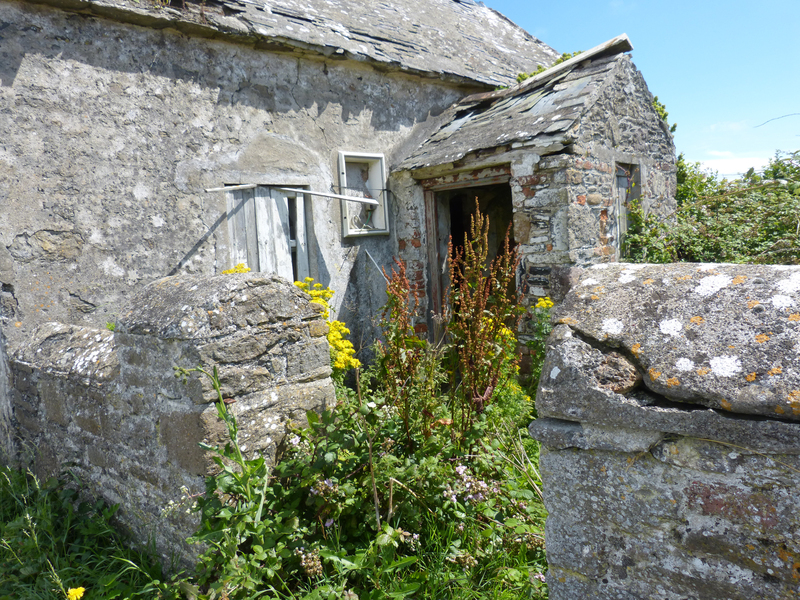 This building, which may date to the 1600s, was the kitchen on the old farm. The highlight is the chimney wall. As is the entire building, the wall is made of local stone but it’s the enormous chimney that is so remarkable. I can literally stand in the fireplace. To the left I’ve found the remains of the ancient bread oven. When the present owners restored this building and made it a rental cottage they had a loft built over the kitchen which is where I sleep. I climb a steep staircase to a room where even I (at 5’ tall) can stand only in the center. I crawl into a very comfortable queen size bed and there I’ve been sleeping very well. I’ll post pictures of the cottage below. Last year I spent six weeks on this ancient farm. While I was here I made three new friends. Susan, the mistress of Fruit Hill, has always been kind and accommodating to me. We have emailed often, beginning before we’d ever met. Susan works very hard to maintain her three rental cottages and an enormous, ancient house which is her family’s home. My other Irish friends are Mary, a horticulturalist who is on the staff at the John F. Kennedy Memorial Garden and Arboretum, and her colleague Jerry, also on the staff at JFK. They were much more than helpful to me last year when I spent many days at JFK Arboretum. I was delighted to find Mary there yesterday and to quickly catch up with her. I’d lost her email address after I left last summer and the letter I wrote to her never reached her so we have plenty of catching up to do. I was happy to find Jerry there today. All three of my Irish friends are a fine examples of the friendliness of the Irish people. There are many reasons why I love Ireland: the beauty of the landscape, all rolling green hills here in the Southeast; nature’s care for this cool northern island, shown by the lush plants, both wild and domesticated, which grow and bloom everywhere; the mildness of the weather – no 97 degree days for me this summer! But most of all I come here for the kindness of the Irish people, from clerks in the supermarket to the guides at every tourist site to my new friends who became my friends almost instantly. I am very happy to return to Ireland. Now, some news: last week while in Scituate I was able to spend time with my grandsons who are now young men in their mid-20s, and with two of my step-sons who live in Maine and Rhode Island. I rarely see my family because I’ve moved south so I really enjoyed being with them. While I was there my grandson, Chris, proposed to his lady, Amanda, and she accepted! There’ll be a wedding to work into my plans for next year. And yesterday, my step-daughter, Patti, became a grandmother for the second time, when her son’s wife, Jenna, gave birth to a baby girl literally in their Honda in the parking lot of the hospital. I’ve already seen a photo of beautiful baby Clare. She’s going to be just a gorgeous as her big brother Aaron, who is just now turning two. My plan for connecting to the Internet is being foiled by the two foot thick stone walls of my cottage. One project for today is finding a way to make my hot-spot work here. I’m able to receive email on my phone, so I hope you will write to me while I solve this problem. Please travel with me (vicariously) through the next three months in emerald Ireland. It’s going to be fun! Some photos of my little ancient cottage, my home for the summer ahead. 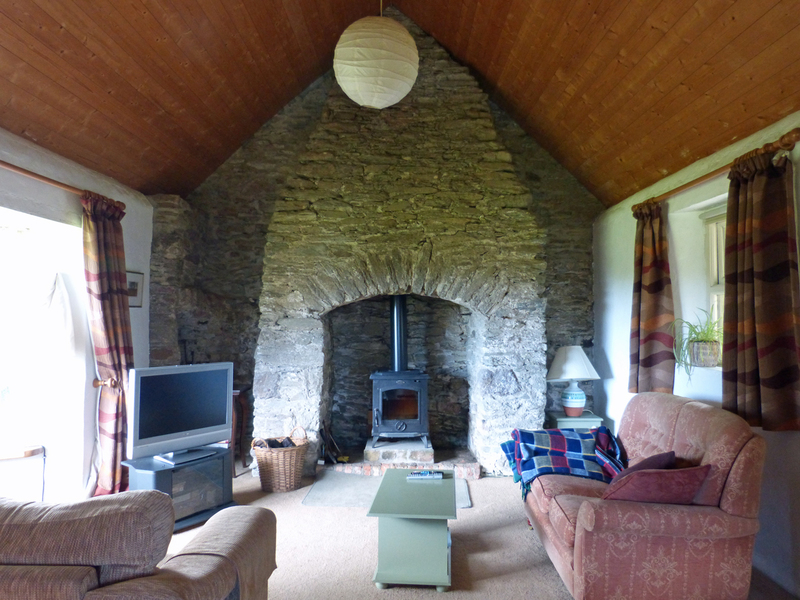 The main room of my cottage with the enormous ancient chimney wall. 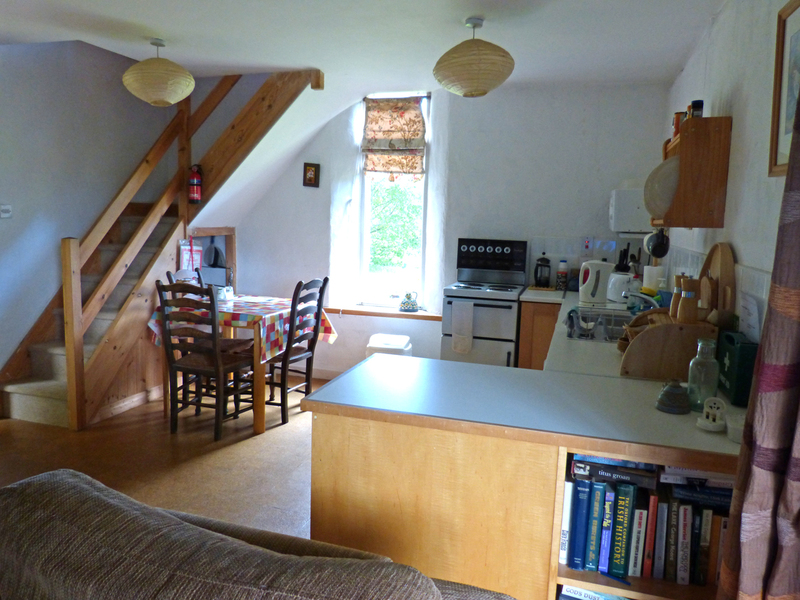 A view of the kitchen and the stairs to the loft. 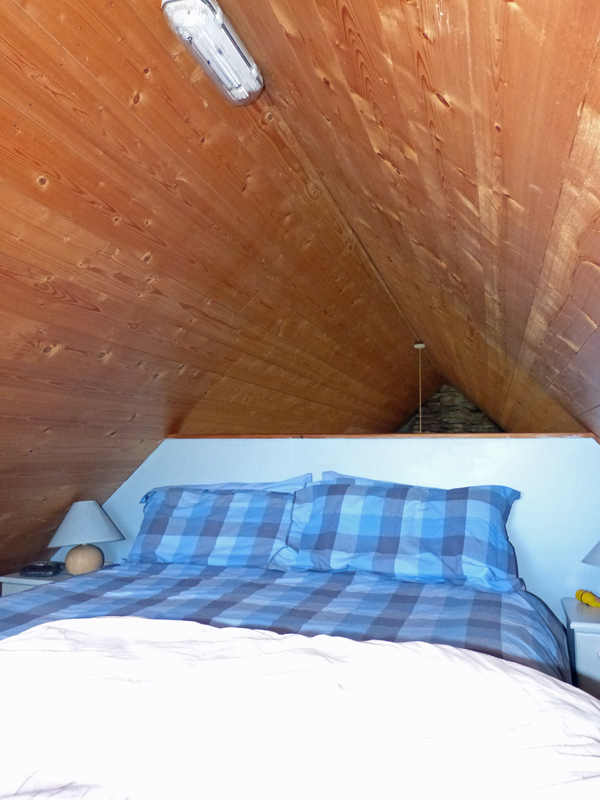 Even I (only 5′ tall) can barely stand in this attic loft.